In my Bio I mention that I was a avid bicylist. One of the things I did riding my bike was to particapte in rasing money for the MS Society which is a very important and good cause. Without it a lot people who have MS would not get needed help to make there lives better and more pain free. This year for the first time in four years I have elected not to do another MS 150 which will be held next week. This would have been my sixth time to do one if I had particapted. In all I have ridden closed to a thousand miles raising money by riding my bicycle for the MS Society and raised approximately three thousand dollars . I do not really feel good about not doing one again this year but I felt it was a futile effort and I don't have the money to waste since I didn't do so well last year. So why am I not doing it this year. It pure economics. Last year I raised about $670 for MS. It cost me out of my pocket closed to $500 to raise the $670. Participating in these events one has to pay for all of his own expenses except for meals provided during the bicycle tour. I always make a personal donation on top of my expenses. It does not make a lot of sense for me to spend so much money and not do better at fund raising than I did last year. One person who had volunteer and committed their selves to sponsoring me withdrew their Pledge at the last minute . I did not have enough time left to try and make up the difference. It wasn't a money issue he just decided to sponsor someone else without notifying me of his change of heart until I reminded him that I had to ge all the money pledged turn it. He was one of my best friends and this did not go over very well with me.. I had others who pledge to sponsor me and and they did not live up to that pledge. I was even banned from particpating in my high school web site by a person I grew up with and like very well. I was not allowed to mention my charity work and it got posted anyway on the site by one of my friends and so we both were banned pernamently. Asking money for charity is hard enough without these kind of things happening. To often I am made to feel like I am begging for money for myself or that somehow I am personally benefiting by this. If I am benefiting it is by the exercise I get and the knowedge that I am doing something worthwhile. I am very proud of my past efforts. I have also paid a high price for doing these charity rides by losing friends that I did not want to lose just because I ask for sponsorship. They now avoid me so I want ask again. Maybe next year I will try to do one again in spite of my bad experiences. On another post below I have a lot errors in it. For some reason the software is not permitting me to edit them. I may be doing something wrong but I havn't figure it out. Since my last post I have been contacted about my doing a show in Lancaster. It going to happen now. I not sure of the date as I need to first take inventory of what turning I have left after I return from the Artisan Center this weekend. How much I have and how much I will have to make in order for me to have a very good show will determine how soon I can be ready to do a show. I like to do one this year but that may be pushing it. A picture of one of my first ornamental jewelry boxes I made sometime ago. This is the ornamental bowl I am currently workng on. It is not finish yet. I still have to turn the bottom of it and finish it with lacquer. That will have to wait until the next time I come to Lancaster. I not sure I like it now as I deviated from my orginal concept and I wish I hadn't done that. I think it is still nice but not as good as it would have been if I stay with my concept. Oh well there is always another turnng and I will get it the way I wanted it in the first place. What a summer I have had. I can’t believe that I have been in Lancaster for just about the whole summer. I only went back to Charleston two or three times for a few days each. But we are not quite ready yet to move to Lancaster full time and so I must go back to Charleston once again today but it will be only for a very short time. I manage to make about 20 new turnings this summer which is more than I expected to get done. That is pretty good when I consider that some of them were new techniques I never done before. 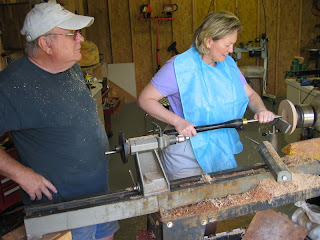 I wasn't sure how my leg would hold up standing at the wood lathe but it did not bother me that bad. I sometimes had to quit to rest but otherwise I had few problems. For those who reads my blog and don’t know I severely injured my leg almost four years ago and this nearly ended my woodturning career. I really never though I would be able to turn wood again which I was not able to do for about three years. 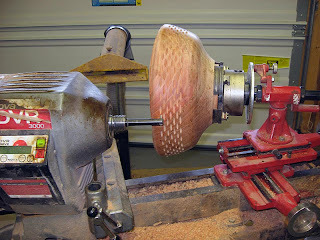 I had hope that on my stay at our new home this time I would have had a date set to do a show of my woodturning. This has not happen and I done all I know to do and I still have not heard a thing about this from the folks at the art center. I had hoped to know something by now. Most of the work I was planning on saveing for doing a show in Lancaster I am now placing them instead in Walterboro Artisan Center this weekend. Sales have been very good there and my stock is low. 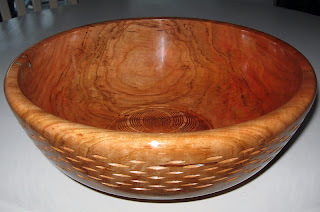 Although I do quite well with my woodturning in the Charleston area I am not known in the Lancaster area and I want to do something about that. My hopes to do a show in Lancaster as I had been planning has not panned out so far and I will have to find other ways to building my reputation up in my hometown of Lancaster which I should do anyway. This has been really a let down for me as I really wanted to do a show in my hometown but I will find other avenues to promote my arts. Well I have to get the house of clean up and my shop as well so I don’t leave a dirty mess behind. I will post a picture of my latest OT turning when I get it finish hopefully sometime next week. My daughter is trying her hand at woodturning. I am just standing by and letting her go at it. I gotta give her some lessons. Day two working on making a OT Bowl. Had a time today making the design on the inside of the Bowl. There is a plate on the OT turning attachment that has three rows of holes in it. These holes are used to space the cutter so it will cut the design that I came up with using a computer. The OT attachment has a pin that is put the the holes on the plate needed to get the spacing right. Once the cut is made then the Plate is rotated to another hole so another cut can be made over and over again until the pattern is completely cut. This is repetitouos and if I lose count I screw it up. Well I can't count so good and screwed it up. I screw up the second time because I forgot to position the pin to the right hole pattern. Luckily I salvage it by just changing the design which allow me to continue using the same hole pattern. This pictures shows the design in the bottom of the bowl and the design on the side that I did yesterday. 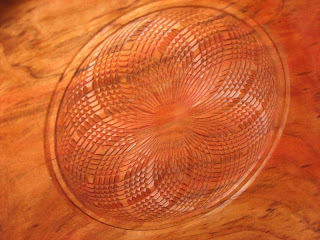 This a close up view of the pattern that I cut in the botton of the bowl. I had planned on cutting more designs in the bowl but the shape I chose to use for this bowl did not lend itself to doing any more OT designs on it. The next step is to do a little more sanding then put sanding sealer on and it will be ready to put lacquer on it which I am doing now.. Hope it looks as good completed as I think it will. Well tomorrow is clean up day when I am through with that I have to pack up to head back to Charleston so I can go to Walterboro to put some more turnngs there. This OT Bowl will have to wait until I get back for me to finish it. Today I started a OT turning (Ornamental). OT turning is a little more complex than conventional turning. I use a Ornamental cutting attachment to cut designs in the Bowl or whatever I am making. 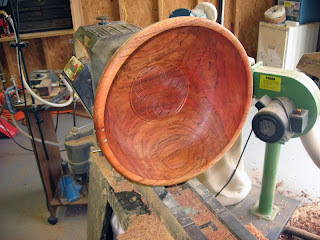 This is a picture of the setup I used to cut the OT design in the side of the Bowl. It not much now as there is still a lot of work left to do. If you click on each picture they will expand for a better view. 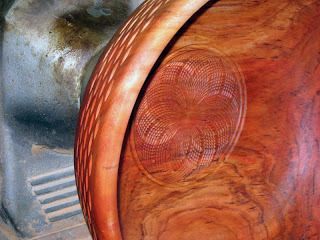 This is a close up showing the OT design in the side of the unfinish bowl. Still have some sanding to do on the side. Tomorrow I will take the OT attachment off and remount the bowl to turn the inside out. After the inside is turn more OT designs will be cut on the inside of the bowl. I will post more pictures of the progress in making this OT Bowl. Stay tune more to come. 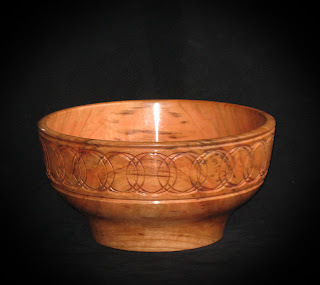 This is another OT bowl I recently made and posted a picture of it in my last blog. 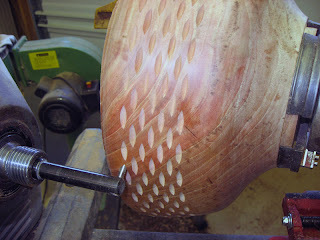 I just thought I would add it again in this blog so you would know it is a OT design in the side of the bowl.